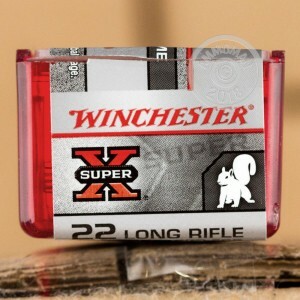 This Winchester Super-X 22 Long Rifle ammo is the prefect round for your firearm is you have some small game hunting to do. Each round is loaded with a 40 grain Power Point copper-plated hollow point bullet. It has a muzzle velocity of 1280 feet per second out of a 6 inch test barrel. This ammo will make short work of any squirrel or rabbit you will come across. As with other full power loads, this rimfire ammo should function well in semi-auto rifle and pistols. 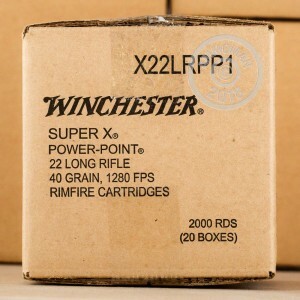 Order more than $99 worth of ammo, and you will qualify for free shipping. 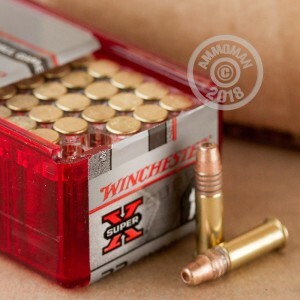 Order you Winchester ammo today!